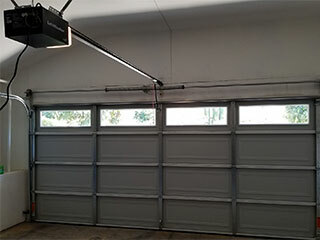 One of the most frustrating symptoms requiring professional attention when it comes to garage doors is a grinding and screeching noise during operation. This can usually be an indicator of a more severe problem developing so it should definitely not be ignored. There are a number of reasons why your garage door opener system might have started to make these noises. It's usually the result of improper maintenance but it's also worth checking for common issues like rust forming on the door hinges, a bent garage door track or components requiring lubrication. In many cases, eliminating the noise can be as simple as applying a spray lubricant to the moving parts. If this does not resolve the issue, examine the components of the system, looking out especially for rusted parts and loose fixings. If you find parts that clearly need to be replaced, our technicians have plenty of spare parts in stock and can provide replacements. Use a hammer to gently tap out any dents, bends or damage to the track. Then, use a level to check the tracks are properly aligned. If they are not, you can try to loosen the fixings and manipulate them back into a straight position before retightening the fixtures. This can be fairly tricky work, so you may prefer to contact a professional for assistance. It is worth spending a little time on maintaining your system - this will go a long way towards preventing future accidents. A regular routine of cleaning debris and dirt from the tracks, lubricating moving parts and tightening loose fixtures help to eliminate grinding or screeching and reduce the risk of more severe malfunctions occurring. Regular maintenance can also prolong the lifespan of your system and ensure smooth and reliable functioning for years to come, making it a valuable time investment. For further information, just contact our experts at Garage Door Repair Hercules!